Wow! Things have been escalating in the physical, emotional, and spiritual! Lately I cannot get enough of reading the word, studying prophecy, catching up on current events and praying. We all as believers have that yearning for more when we are hungry. I know I do! I know hat I am no where near perfect and have a lot to work on my in soo many areas. I am thankful that He is humbling me and I’m praying for more humbling as this process continues. I’m trying to embrace all of the correction he throws my way. First, I would like to start off by saying this was one of the most amazing dreams I have had. I definately remember this dream but had not remembered the whole thing or that I had posted it to social media when I had it. I just recently started keeping a dream log to reference back and have not written any of my older but seemingly important dreams down. It’s one of the reasons I have been posting them here and there. 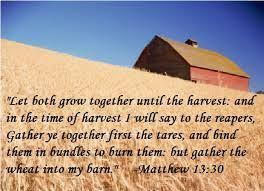 The Wheat and the Tares- Is it time for the harvest? I have read this parable spoken by our Messiah many many times. Heard it preached many many times. I'm sure if you have read your bible or been in church you have heard of this parable and are probably well versed in it. In fact, our Pastor just was speaking about this last week. I will post the passage in scripture then explain the dream that I had just last night. I was not even sure right when I woke up which way it went but when I thought back on it and went over it in my head, it brought me to tears. I truly believe that it was Him speaking to me. I seem to see things in black in white and I always seem to have a sense of conviction and testing about a lot of things. So, here we go!